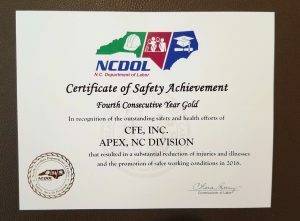 CFE, Inc. North Carolina Division Wins Safety Award - Evans Roofing Company, Inc.Evans Roofing Company, Inc.
For the fourth consecutive year our CFE, Inc. North Carolina Division has received the Gold Award for Safety from the North Carolina Department of Labor. Congratulations to our hard working associates who make this possible! 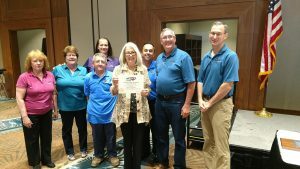 Photo L to R is: Josephine Campaniello, Nancy Swinson, Celina Uribe, Mark McKinney, Cherie Berry (NCDOL). Carlos Duran, Aaron Whaley and James Russo.